Museum Gift Shop Make Over! 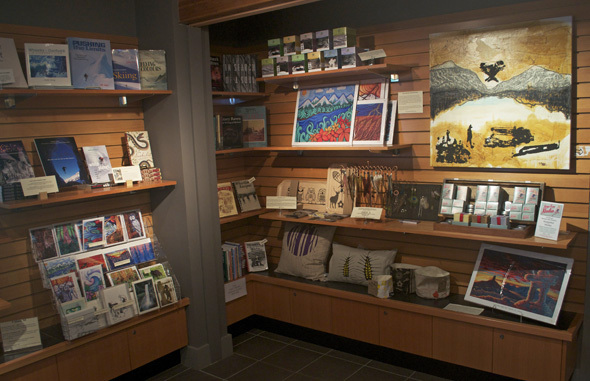 The Whistler Museum is pleased to announce that our gift shop will now be featuring works from local artists. We have built on our pre-existing collection of books, souvenirs, and cards by adding artwork and crafts from a variety of Sea-to-Sky locals. We are now the only retailer in Whistler to be featuring ‘LUprints’ by Pemberton artist Ulla Clark, who creates unique screen prints. Her work has been featured in magazines such as Dwell, Canadian House & Home, and Glow. 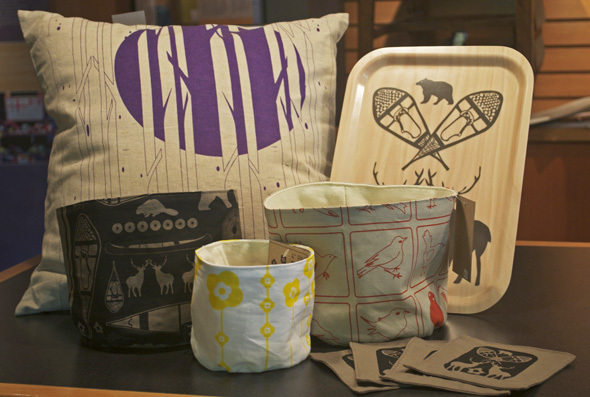 We have a number of LUprints items available including birch trays, coasters, and pillows. Feather earrings by Koz Creations. We carry prints and cards by local artists Vanessa Stark and Chili Thom, in addition to beautiful hand painted cards by Isobel MacLaurin. 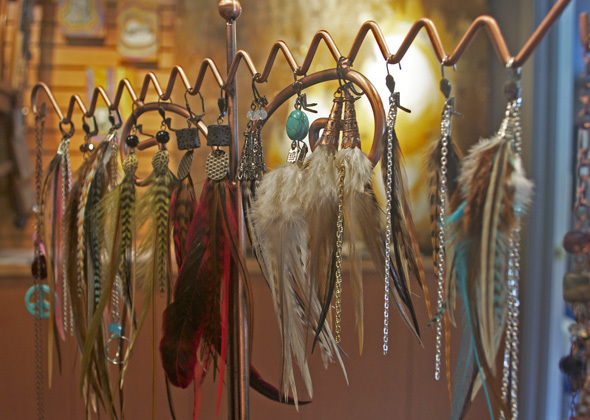 We are featuring Koz Creations’ unique feather earrings, some with locally sourced feathers, by Whistler artist Chelsea Kozlan, locally handcrafted soaps from Soap Tree Studio, and tea from Namasthe. We will continue to carry books by local authors. Our collection currently features books by Stephen Vogler, Kelsey Bareham, Leslie Anthony, Sara Leach, and Sylvia Dolson. We have just added several original paintings by Stan Matwychuk to our display as part of ArtWalk, and are constantly updating and adding new items to our shop. If you’re shopping in the village, be sure to stop by the museum to pick up a unique gift, an interesting read, or something special for yourself (and of course tour our fascinating displays!). This entry was posted in News & Events and tagged ArtWalk, Gifts, Koz Creations, LUPrints. Bookmark the permalink.